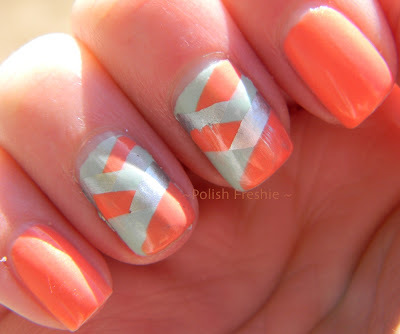 The new fishtail mani seems easy enough and there are a lot of informative tutorials out there to help get it right. I decided to give this design a go. It was really hard to capture the true hues of these polishes and I'm not loving this photo, but it was the best of what I had - sorry kids! This is two coats of the wondrous China Glaze Mimosa's Before Mani's. This warm coral shimmer really complements my skin tone. No wonder everyone has been raving about this polish (name craziness aside). Accent fingers were done with China Glaze Keep Calm, Paint On and Color Club On the Rocks. I had a few bubbles here and there, but overall think I executed just fine and really like this style of nail art. Just be careful and make sure you give yourself plenty of time to dry as it is so many layers on top of one another.